In this vicinity the Wales Coast Path rounds the shoulder of a hill which is topped with the remains of an Iron Age fort, known in recent centuries as “Top Castle”. 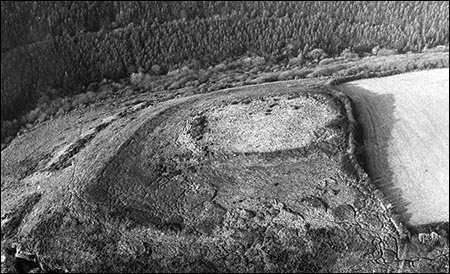 Promontory hillforts were common along Wales’ west coast in prehistoric times. They were positioned where most of the surrounding land dropped steeply, making them harder to attack and easier to defend. During the Iron Age (c.800BC to c.100AD) there were two hillforts on this stretch of the coast, one being at Gilman Point, near Pendine. The fort near Marros was c.100m above sea level. Surviving remains include a long bank of earth, which is c.2.5m high when approached from outside the fort. 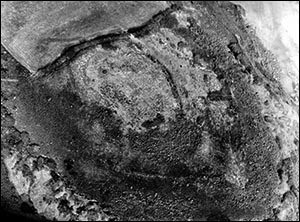 The aerial photos shown here, courtesy of Dyfed Archaeological Trust, reveal a clear oval shape on the hilltop. There are remnants of peat beds beneath the surface of Marros Sands. The peat beds were formed when Carmarthen Bay was marshland, populated by forests of oak and alder. Some of the plant remains have been radiocarbon dated to c.3000BC. Neolithic peoples lived in the area at the time. Tombs with stone chambers provide evidence of their presence. Remains from the later Bronze Age include ritual burial monuments, such as barrows and ring cairns. On the slopes leading down to Marros beach, there are relics of medieval field boundaries. Traces of earlier field boundaries, possibly from the Bronze Age, were destroyed in the 1980s. The village of Marros lies on the open heathland of Mynydd Marros. Possible elements in Marros are march (“horse”) and rhos (heath), recalling the wild horses which used to graze on the mountain.